This Mylapore house goodie box, illustrated by 25-year-old Bhavya Desai is the perfect gift for anyone who is in love with old Madras. Love cartoons? Love Chennai? Love cartoons about Chennai? Well, look no further. 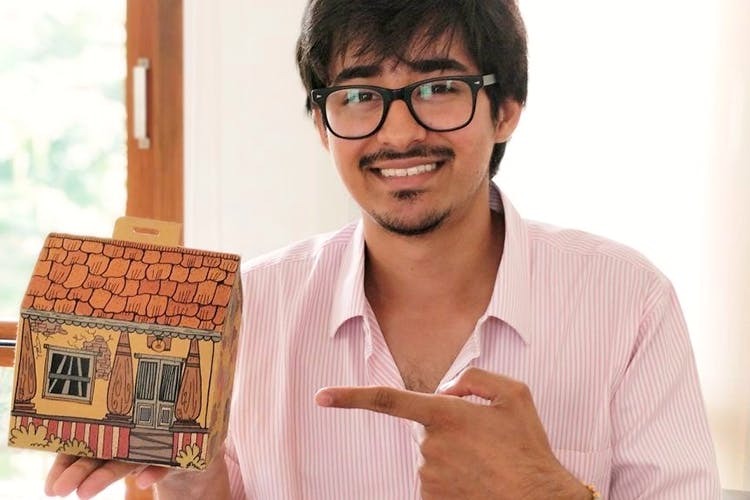 These brown mount board boxes (that you can even use as home decor) are covered in illustrations of quaint Mylapore houses with worn-out walls, bright coloured windows, “stick no bills” signs – the works! Cycling around Mylapore and in awe of the local sights and sounds of the bustling area, Bhavya couldn’t help but be inspired by its old world charm and culture. What’s inside, you ask? Have a look at Bhavya Desai’s Instagram handle and its hard not to fall in love with his googly-eyed characters. One of them is of a yogi practising some gravity-defying asanas. Oh, and he’s got his favourite companion (and ours, to be honest) along – filter kaapi! Bhavya has got these printed onto coasters; you get a total of six in the Mylapore House box and you can buy them for INR 600. Like his other cartoons as well? You can find his adorable illustrations on postcards, t-shirts, and mugs. You can even ask for customised pieces (get your friend drawn into one of his endearingly loony styled characters). The perfect gift for your BFF, no?